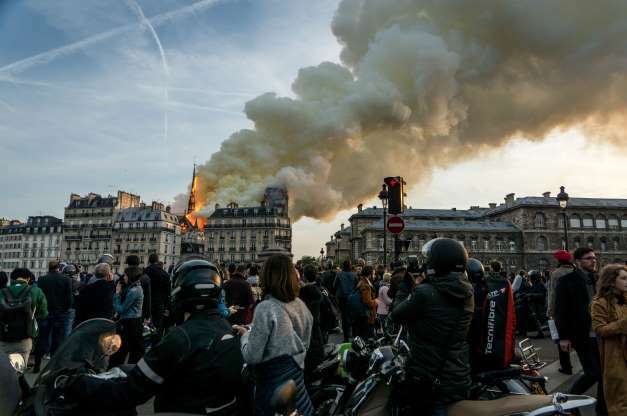 The world is still recovering from the shock of the fire that ravaged the Cathedral of Notre Dame in the center of Paris. The iconic church’s steeple collapsed. Its roof caved in. The interior was engulfed in flames. That’s the bad news. However, the twin towers are still standing. The sanctuary’s crucifix is, too. Many of the church’s most cherished artifacts have been saved from the inferno; one of them is the crown of thorns believed to have been worn by Jesus Christ on the day he was crucified. There’s more hope emerging. French billionaires have pledged as much as $300 million to restore, repair and revive the iconic symbol of the Catholic Church. That the fire would erupt during Holy Week only adds to the heartbreak as Christians worldwide prepare to celebrate the joyous Easter holiday. Thus, the Notre Dame cathedral usually stands as an iconic symbol of the joy that Christians feel as they celebrate Jesus’s resurrection. This year, though, the cathedral — nearly destroyed by a fire believed to have started because of work being done on the 850-year-old structure — stands as a reminder of hope in another fashion. It stands as a testament to the will of people to rebuild a cherished symbol. I feel the need, too, to salute the heroic effort of the firefighters who faced down the flames, controlled the fire and somehow managed to prevent a horrific catastrophe from becoming even more heartbreaking. French President Emmanuel Macron vows to “rebuild” the Cathedral of Notre Dame. It would be foolhardy to bet against it.